← Winners of our Rainy Day Guarantee! Happy Birthday to everyone born in September! There are many facts that you may not know about this intense blue gemstone. How does it get its color? Where are Sapphires mined? Did you know that Sapphires come in many colors? Let’s find out! I thought all Sapphires were blue? Like most of us, when you see a deep blue stone you immediately think it’s a Sapphire, but did you know that they also come in a variety of colors and shades? Well, it happens to be that sapphires are made up of the aluminum oxide mineral corundum which comes in various colors depending on trace amounts of other elements. The red variety of corundum is a Ruby. 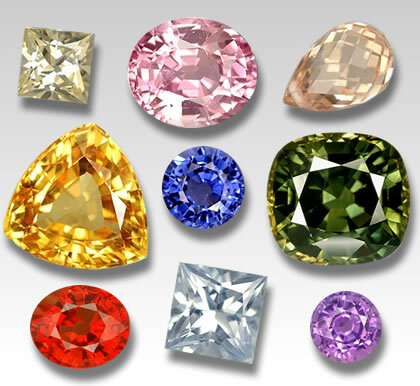 So sapphires can be almost any color, depending up the traces of other elements, unless they are red. Red sapphires are not sapphires, they are indeed rubies. The Padparadscha Sapphire is the pinkish orange gemstone in the upper right hand corner of this photo below, and is much more expensive than the deep blue Sapphires that we all know and love. So where do we find sapphires? All over the world! The top producers of this amazing gemstone include such places as Brazil, Tanzania, Sri Lanka, Kashmir, Thailand, Madagascar and Australia. Even the state of Montana produces this fine gemstone. Last year I also wrote a blog about the lovely Sapphire, which you can read about it here. 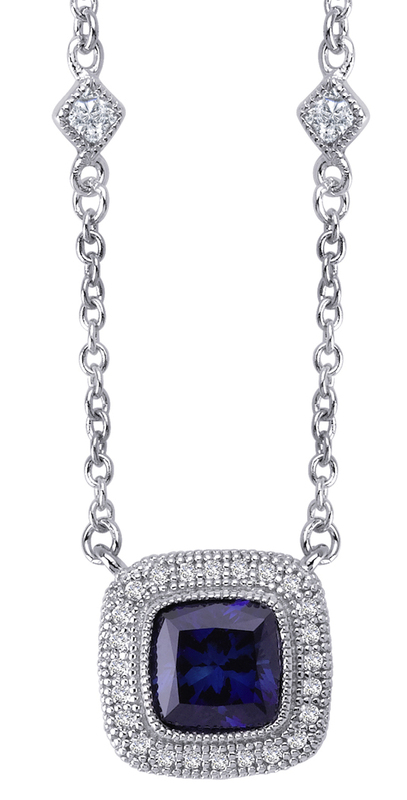 To see our collection of Sapphires, click here. This entry was posted in Birthstones, Jewelry, Jewelry History, Jewelry Metals, Jewelry Trivia & Facts and tagged jewelry warehouse, sapphire, sapphire jewelry, sapphires, september birthstone. Bookmark the permalink.